Jim Brown, a star running back for the Cleveland Browns in the late 1950s and early 1960s, is the subject of a new biography by The Nation sports editor Dave Zirin. 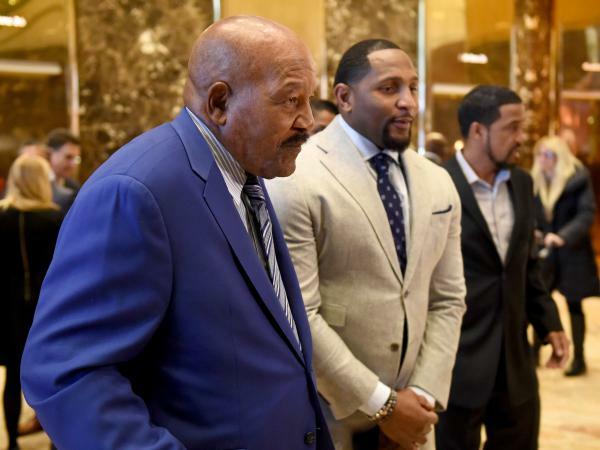 Retired NFL greats Jim Brown (left) and Ray Lewis address the media after meeting with then-President-elect Donald Trump at Trump Tower in New York in late 2016. Many consider the running back Jim Brown the greatest American football player ever. But he's known as much more than an athlete — he's an activist, an actor, a thinker and a man with an alleged history of violence against women. Here's how he's described in the opening paragraph of Dave Zirin's new biography, Jim Brown: Last Man Standing. Football is the closest thing we have in this country to a national religion, albeit a religion built on a foundation of crippled apostles and disposable martyrs. In this brutal church, Jim Brown is the closest thing to a warrior Saint. Zirin, sports correspondent for The Nation, spoke to NPR about this complicated figure, who is now 82 years old. "I think it's important that when we look at these icons of the past, that we look at them not as these kinds of immortals," Zirin says. "Because if we do that, when we deify people, the problem with that is then there's nothing to learn from them or their lives. It's a story of somebody who is very flawed, but somebody who also did heroic things. 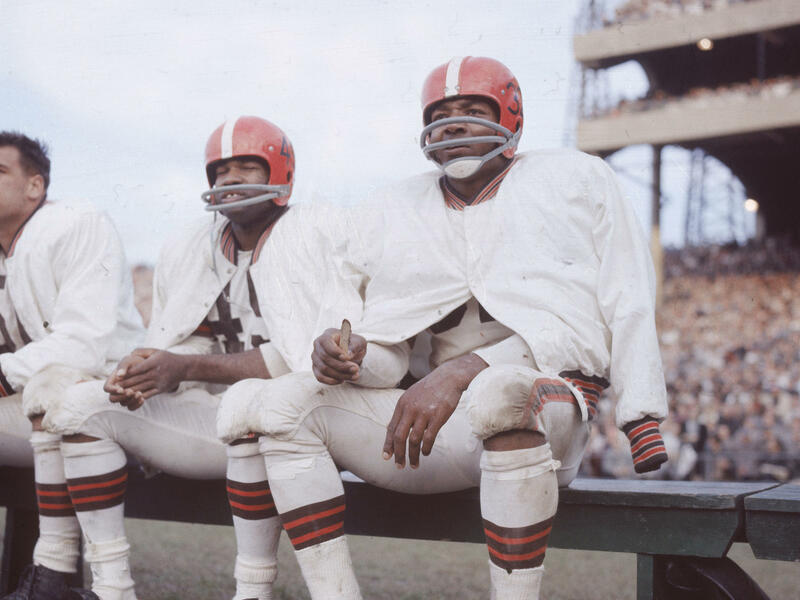 As Howard Bryant, the great sportswriter, said, he said: Jim Brown is heroic, but he's no hero. And I think that's the best way to look at his life." There's a discussion happening right now — not just in the world of sports, but I think nationally — about masculinity, and about what it means to be a man, what it means to be a real man. And I think we are assessing some of what we've been taught. And I think Jim Brown, for the last 50 years, has been this kind of icon of the old way of looking at manhood: somebody who defined his manhood by not showing a great deal of emotion; by playing in the National Football League and never missing a game for injury, and being lauded for that; as being somebody who stepped inside the black power movement and was an icon; as someone who stepped into Hollywood, and was thought that he could be the black John Wayne and participated in the blaxploitation era, which was a very hyper-masculinized form of cinema at the time; and as somebody who stepped to the terrain of the gang battles in Los Angeles in the 1980s, and did a tremendous amount of activism to try to bring warring gangs together and bring peace to the streets of South Central Los Angeles. And all of these landscapes he did with this resolute focus on teaching people of what it means to be a "real man." And one of the things I try to argue in the book, and this connects with the discussions which are happening right now about masculinity, is whether or not that discussion of manhood is positive or negative. And so I also look in the book about Jim Brown's history with women, which is the dark side, if you will, of this discussion about masculinity — particularly the issue of violence against women. And this is something I think we forget historically, is that there was a black freedom struggle in this country, but there was a left wing and right wing to that freedom struggle. It's not like everybody believed in marching, or everybody believed in the Montgomery bus boycott, sit-ins. There was a wide variety of thinking about how black liberation could be achieved. And Jim Brown was, you could argue, on the conservative wing of that camp. And I think it connects to why Jim Brown today is a supporter of Donald Trump ... and why he supported Richard Nixon in 1968, as did other figures of that era like the singer James Brown and Sammy Davis Jr. Like, there was black support for Richard Nixon in 1968, and it was built around this idea of economic self-sufficiency. See, this is what I'm trying to argue with this book, because a lot of people in the sports world were shocked when he said these things, saying: How could Jim Brown, this icon of the black freedom struggle, how could he possibly bury Colin Kaepernick in this way? How can he possibly go into the locker room and tell players to stand up and shut up during the national anthem? And part of what I'm arguing is that: No, these have always been his politics. He's always had this strain of conservatism in his politics that black people do not achieve advancement through the politics of protest, but through the politics of earning as much money as possible, and trying to get out of the capitalist system whatever they can for the purposes of building economic self-sufficiency. And protest is an impediment to that in the mind of Jim Brown. And those have always been his politics. What I find so interesting is that his stature on the field, I think, blinded people to what his politics were. I'll tell you an example of this that I find so interesting, is I scoured the black press in 1968 for when Jim Brown endorsed Richard Nixon, and there are scathing editorials against other black celebrities who were endorsing Nixon, and you could not find a bad word about Jim Brown. It's a series of accusations that go from the 1960s through the 1990s, and without a conviction. ... The repeated accusations and descriptions lead you to look at this as a situation where Jim Brown, at times in his life, definitely saw women as part of the problem, as something that would bring down the black family if they asserted themselves too much in the context of his life. And the accusations against Jim Brown are horrific, and they should be viewed as horrific. But it's important to say that when they took place, that's not how they were viewed — they were viewed with a nudge and a wink. And so part of what I'm writing this book is getting us to reassess those times and say: The time of nudging and winking and violence against women has to end — it has to go into the graveyard of history. Sarah Handel and Viet Le produced and edited this story for broadcast. Patrick Jarenwattananon adapted it for the Web. In the opening paragraph of his new book, Dave Zirin writes this. Football is the closest thing we have in this country to a national religion, albeit a religion built on a foundation of crippled apostles and disposable martyrs. In this brutal church, Jim Brown is the closest thing to a warrior saint. Brown is considered by many the greatest football player ever. But as alluded to in that excerpt there, he's much more - an activist, an actor, a thinker and a man with an alleged history of violence against women. Dave Zirin is The Nation's sports correspondent. And he joins us in the studio to talk about this complicated figure and his biography, "Jim Brown: Last Man Standing." Thanks for being here. DAVE ZIRIN: Oh, it's great to be here. Thanks for having me. GARCIA-NAVARRO: So why Jim Brown and why now? ZIRIN: There's a discussion happening right now not just in the world of sports but I think nationally about masculinity and about what it means to be a man, what it means to be a real man. And I think we are assessing some of what we've been taught. And I think Jim Brown, for the last 50 years, has been this kind of icon of the old way of looking at manhood, somebody who defined his manhood by not showing a great deal of emotion, by playing in the National Football League and never missing a game for injury and being lauded for that, as being somebody who stepped inside the Black Power movement and was an icon, as someone who stepped into Hollywood and was thought that he could be the black John Wayne. And all of these landscapes he did with this resolute focus on teaching people of what it means to be a, quote, unquote, "real man." And one of the things I try to argue in the book - and this connects with the discussions we're happening right now about masculinity - is whether or not that discussion about manhood is positive or negative. And so I also look in the book about Jim Brown's history with women, which is the dark side, if you will, of this discussion about masculinity, particularly the issue of violence against women. GARCIA-NAVARRO: There's a lot there. But I want to start just so we can understand the context here, which is his beginnings, you know? All lives are lived in the context of how people grew up. So remind us briefly where and how Jim Brown grew up. ZIRIN: Well, it's a fascinating story because Jim Brown was raised by women on St. Simons Island off the coast of Georgia. And St. Simons was a place that was built on self-sufficiency because the ground was so rough that when enslaved people were brought there from Africa, their communities were largely left alone. And this, I think, made a mark on Jim Brown throughout his younger years - of this idea of not being an integrationist, not being someone who supported the goals of Dr. Martin Luther King, of being someone who more was on the side of, how do we, as black Americans, build our own institutions of power and self-sufficiency? GARCIA-NAVARRO: ...He spoke out against Dr. King. Explain the kind of activism he embraced. ZIRIN: And this is - something I think we forget historically is that there was a black freedom struggle in this country. But there was a left-wing and a right-wing to that freedom struggle. It's not like everybody believed in marching, or everybody believed in the Montgomery bus boycott sit-ins. There was a wide variety of thinking about how black liberation could be achieved. And Jim Brown was, you could argue, on the conservative wing of that camp. And I think it connects to why Jim Brown today is a supporter of Donald Trump and why he supported Richard Nixon in 1968. And it was built around this idea of economic self-sufficiency. GARCIA-NAVARRO: ...And the protest movements of today, like Colin Kaepernick. ZIRIN: It's fascinating to me because Jim Brown said just the other week on the NFL Network that if he was the general manager of a team, he would not sign Colin Kaepernick. Last year, he walked into the locker room of the Cleveland Browns, the team that, of course, made Jim Brown famous. And he told players who had been kneeling that they needed to cut it out. GARCIA-NAVARRO: And what is his thinking on this? ZIRIN: See, this is what I'm trying to argue with this book because a lot of people in the sports world were shocked when he said these things, saying, how could Jim Brown, you know, this icon of the black freedom struggle - how could he possibly bury Colin Kaepernick in this way? And part of what I'm arguing is that he's always had this strain of conservatism in his politics - that black people do not achieve advancement through the politics of protest but through the politics of earning as much money as possible and trying to get out of the capitalist system whatever they can for the purposes of building economic self-sufficiency. And protest is an impediment to that. What I find so interesting is that his stature on the field blinded people to what his politics were. And I'll tell you - an example of this that I find so interesting is I scoured the black press in 1968 for when Jim Brown endorsed Richard Nixon. And there are scathing editorials against other black celebrities who were endorsing Nixon. And you could not find a bad word about Jim Brown. GARCIA-NAVARRO: ...That people didn't really look at some of his problematic history. This is one of the longest chapters of the book. And you talk about how he allegedly repeatedly committed acts of violence against women. ZIRIN: Yeah. It's a series of accusations that go from the 1960s through the 1990s and without a conviction. GARCIA-NAVARRO: Which is why we're using the word allegedly. ZIRIN: Yes, without a conviction. And that needs to be said and resaid. But the repeated accusations and descriptions lead you to look at this as a situation where Jim Brown, at times in his life, definitely saw women as part of the problem, as something that would bring down the black family if they asserted themselves too much in the context of his life. And the accusations against Jim Brown are horrific, and they should be viewed as horrific. It's important to say that when they took place, that's not how they were viewed. They were viewed with a nudge and a wink. And so part of why I'm writing this book is getting us to reassess those times and say the time of nudging and winking at violence against women has to end. It has to go into the graveyard of history. GARCIA-NAVARRO: How then should we think about someone who was an icon who used his celebrity for civil rights and yet was an alleged serial abuser? How do we then reframe that? ZIRIN: I mean, I think it's important that when we look at these icons of the past - that we look at them not as these kinds of immortals because if we do that, when we deify people, the problem with that is then there's nothing to learn from them or their lives. It's not a simple story. It's a story of somebody who is very flawed but somebody who also did heroic things. As Howard Bryant the great sportswriter said - he said Jim Brown is heroic, but he's no hero. And I think that's the best way to look at his life. GARCIA-NAVARRO: Dave Zirin's new book is "Last Man Standing." Thank you so much. ZIRIN: Thank you. Transcript provided by NPR, Copyright NPR.